FULTON, NY – For decades the food pantries of the Human Concerns Center, Catholic Charities of Oswego County, and The Salvation Army, have been an emergency food source for those in need. Given the current economic conditions, both have been faced with the challenge of keeping their shelves filled and meeting the increased demand for food subsidy. Thanks to the generosity of community members, both pantries are continuing to provide for hungry families and individuals in need of food. 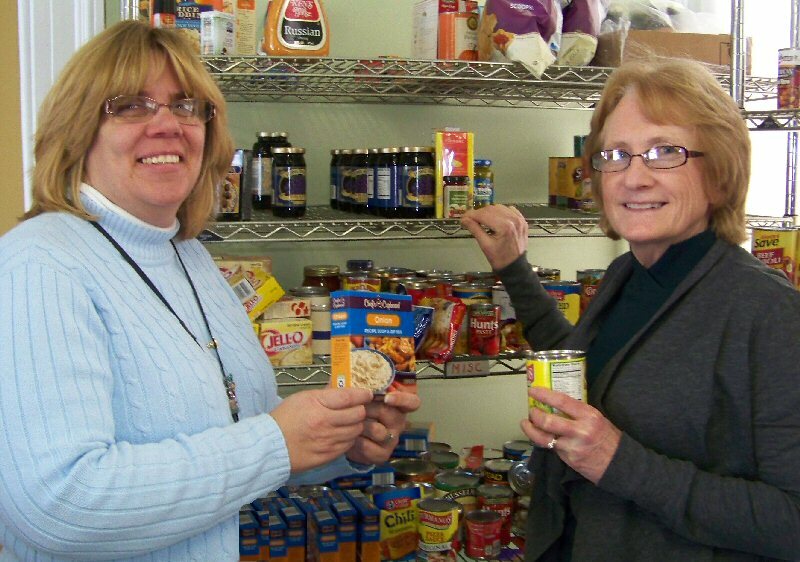 Helen Hoefer (left), supervisor of Community Services for Catholic Charities of Oswego County and Deb Deeb, director of Human Concerns in Oswego, fill the shelves of the food pantry at Human Concerns. While their respective food pantries are facing a record demand for food subsidy, the two are encouraged by the support they have been receiving from their communities. Human Concerns and Catholic Charities each serve approximately 80 to 100 families a week, and even more than that during the last two weeks of the month. “We provide emergency food assistance. When money becomes scarce towards the end of the month they turn to us,’ added Hoefer. Deeb said that the demand on Human Concerns food pantry began to noticeably increase in July. “I started to see a lot of new faces and was concerned about how not only we, but other area food pantries, would be able to meet the demand. Thankfully United Way became involved and helped us address our concerns,” said Deeb. In response to the challenges that Oswego County food pantries are facing United Way of Greater Oswego County collaborated with area food pantries and other human services agencies to form a Safety Net committee. Working together, members of the Safety Net committee developed a strategy that would allow them serve as many families and individuals as possible. “We needed to take a proactive approach so that we may best serve our community now and in the future. We are reaching out to concerned businesses and organizations, as well as families and individuals who are able to assist us in our fight against hunger and poverty in Oswego County and the response has been encouraging,” said Melanie Trexler, Safety Net committee member and executive director of United Way of Oswego County. Thanks to the efforts of the Safety Net committee to raise awareness of hunger in Oswego County Human Concerns and Catholic Charities, as well both the Oswego and Fulton Salvation Army locations were able to feed hundreds of families and individuals during the holidays and have been able to continue doing so during the winter months. “We are very fortunate. Donations from businesses large and small, as well as caring individuals who gave very generously, has had a tremendous impact. Additionally, food drives and donations from area schools, churches, and organizations have also made a difference. The response that we are receiving is encouraging, ” said Deeb. While donations are essential to the survival of food pantries such as Human Concerns, Catholic Charities, and The Salvation Army, both Deeb and Hoefer agree that without the tireless efforts of their volunteers it would be very difficult to keep their doors open. More than 30 volunteers donate their time and talents to Human Concerns and another 25 do the same for Catholic Charities. “I can’t say enough about our volunteers. Their compassion and their concern for their neighbors make it possible for us to serve the number of families and individuals that we do,” said Hoefer. In the months ahead both Deeb and Hoefer are hopeful that the outpouring of support that they have received of will continue. “We want to be able to not only help families that visit our pantries, but also reach out to seniors who are in need but are not able to access our services. If possible, in emergency situations, we would like to able to offer delivery to seniors,” said Deeb. While it may not be noticeable to many, the efforts of agencies such as Human Concerns, Catholic Charities of Oswego County and other human services agencies do much to improve the quality of life in Oswego County. These efforts may not be possible if not for community support they receive. “We are fortunate to live in a county were our communities have demonstrated their willingness to help their neighbor. Now, more than ever, we rely on that spirit of compassion and caring to continue to serve those in need and provide them with the services they so desperately in need of. We truly appreciate the work that our food pantries do and are proud to be able to support them,” added Trexler. For more information on Oswego County’s food pantries contact your United Way office at 315-593-1900.